In an ideal world we’d all be eating the recommended 5-6 servings a day of fruits and vegetables to maintain optimal health. Studies have shown that this a key factor for healthy living and longevity. With today’s hectic, fast – paced lifestyle this can be a challenge sometimes. Did you know that about 90 percent of the money Americans spend on food is for processed foods? They’re often fortified with nutrients but lack naturally occurring vitamins, minerals, and nutrients found in fresh whole foods. Even if you are eating a healthy diet, it’s not always possible to get all the vitamins, mineral and nutrients you need from your diet. Modern-day diets are often lacking in nutrition, in large part because our food supply is not what it used to be. Why is our food supply less nutritious? 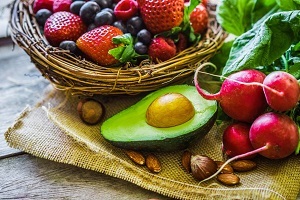 How Can You Increase Vitamins, Minerals and Nutrients in Your Diet? 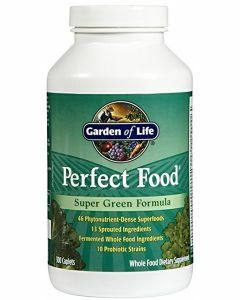 Greens supply a litany of micronutrients your body needs to function optimally. 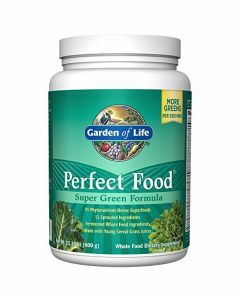 If you are not eating enough greens or simply want to kick start your energy or achieve diet goals, consider adding a green powder supplement to your daily routine. This simple change will help shift your biochemistry so that you actually start craving more greens and less sugar and carbohydrates. 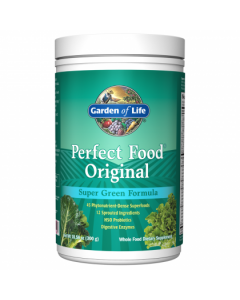 One of our favorites is Perfect Food from Garden of Life, originally formulated by Jordan Rubin. 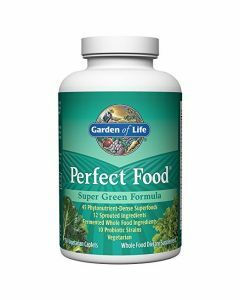 This formula is a balanced blend of nutrient dense, enzyme rich live foods including antioxidant green grasses, calcified red algae, sea vegetables, whole vegetables and their juices, sprouted grains, seeds and legumes. This is just one of the many roles of the Omega 3, 6, and 9 essential fatty acids in this formula. The EFA’s also play a role in regulating blood pressure, hormone production, brain and nervous system function. And last but not least, they keep your cell membranes healthy. Certain greens are superfoods which have tremendous health benefits but we wouldn’t normally eat them. This formula contains spirulina, chlorella, barley grass, and wheatgrass which aid in your bodies detox process. Each serving provides 100% Daily Value of Vitamin A, 83% vitamin C from natural sources, and over 15% of calcium from natural sources. It also contains spirulina, a super food for maximizing your immune system. 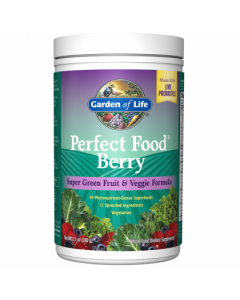 Overcome sluggish energy in no time with the power of organic greens and organic fruits. When you want the benefits of juicing but don’t have the time Perfect Food is delicious and convenient. 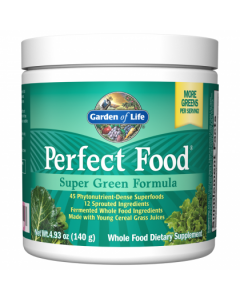 Perfect Food contains every nutrient found in nature.